Hillary Clinton is now officially the first woman to top the ticket of a major U.S. political party. Her candidacy and controversial comments about women made by Donald Trump have raised the question of whether a long-standing gender gap in American politics could grow wider in 2016. 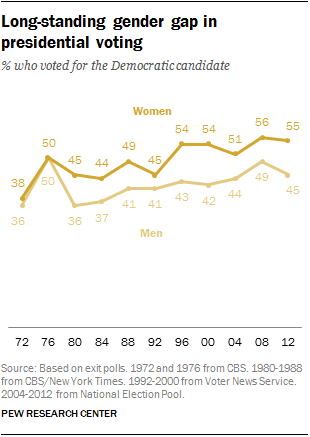 In the 1972 and 1976 elections, there was no difference in candidate support between men and women. Over the last nine presidential elections, however, women have consistently voted for Democratic presidential candidates at higher rates than men. Most recently, in 2012, there was a 10-percentage-point gender gap: 55% of women voted for Democrat Barack Obama over Republican Mitt Romney, compared with 45% of men. The gap in 2012 was little different than it had been in Ronald Reagan’s victory over Jimmy Carter in 1980, when 45% of women and just 36% of men voted for Carter. The size of the gender gap has fluctuated within a relatively narrow range over the past 36 years; on average, women have been 8 percentage points more likely than men to back the Democratic candidate in elections since 1980. According to a Pew Research Center survey conducted June 15-26 (before the Republican and Democratic conventions), there is a 16-point gender gap in general election support for Clinton. Overall, 59% of women voters say they would support Clinton over Trump, compared with 43% of men. Other recent national polls also have found a double-digit gap between men and women in their support for Clinton. An NBC News/Wall Street Journal survey fielded July 9-13 found women registered voters were 13 points more likely than men to back Clinton over Trump in a head-to-head contest. A CBS News poll conducted last week (July 22-24) has women registered voters 11 points more likely than men to support Clinton. More than three months before Election Day, the presidential contest is fluid. It remains to be seen whether the gender gap this fall will be on par with other recent elections, or whether men and women will be further apart in their preferences than in any of the last 11 presidential elections. The June Pew Research Center survey shows the gender gap in presidential candidate preference can be seen across demographic groups. For example, among those ages 18-34, there is an 18-point gap in support for Clinton between women (69%) and men (51%). Among those ages 65 and older – a group that overall supports Clinton at lower rates than younger adults – there is a 13-point gap between the share of women (52%) and men (39%) who favor the Democratic candidate. Differences between men and women also are seen in their views of the two 2016 candidates’ personal traits and characteristics. More women (53%) than men (42%) say Clinton understands the needs of people like them very or fairly well. 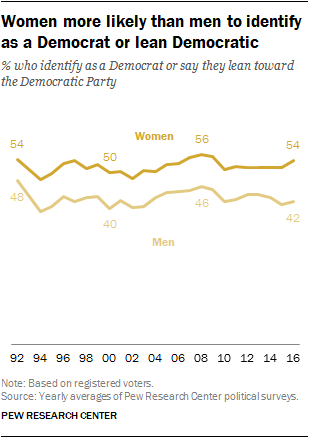 Four years ago, there was a similar 10-point gap between the share of men and women who said that Democratic candidate Barack Obama understood their needs (53% of men, compared with 63% of women). In the Center’s current survey, men were 15 points more likely than women to say Trump understands their needs (44% vs. 29%); in 2012, there was a smaller 6-point gap between the share of men (47%) and women (41%) who said the Republican candidate Mitt Romney understood their needs. Differences in presidential voting between men and women largely parallel differences in party affiliation. In Pew Research Center data dating to 1992, women have been consistently more likely than men to identify as a Democrat or lean toward the Democratic Party. Over the first half of 2016, 54% of women identify with or lean toward the Democratic Party, compared with 42% of men. In 2008 and 2000 – the last two presidential elections with no incumbent candidate – there was a similar difference between men and women in Democratic affiliation. While men and women differ in their party affiliation and presidential preferences, they identify many of same issues as important to their vote this fall. However, women are more likely to emphasize certain issues, including the treatment of racial and ethnic minorities, the environment, the issue of abortion and the treatment of gay, lesbian and transgender people. 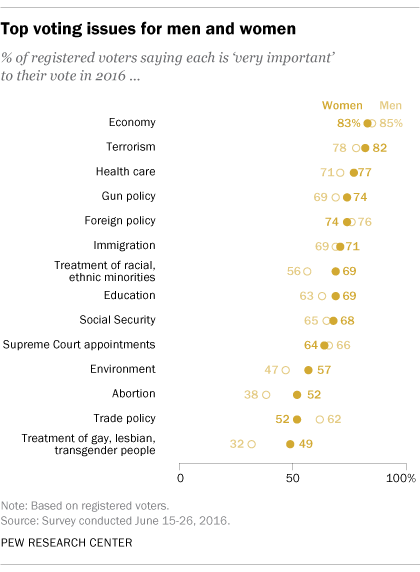 Overall, 83% of women say the economy is very important to their vote and 82% say the same about the issue of terrorism. On these, and many other top issues, there are no – or only modest – differences in the views of men and women. Women place a higher level of importance on the treatment of racial and ethnic minorities than men do (69% of women say this is very important, compared with 56% of men). While abortion and the treatment of gay, lesbian and transgender people rank as lower-tier issues for both men and women, women are more likely to say these issues are important to their vote in the fall: 52% of women say the issue of abortion will be very important to their vote this fall, compared with just 38% of men. Similarly, 49% of women say that the treatment of gay, lesbian and transgender will be very important in their decision of who to vote for; only 32% of men say the same. Trade policy is the only issue that men are significantly more likely than women to call very important to their presidential vote. About six-in-ten men (62%) say the issue of trade policy will be very important to them in making their decision this fall; 52% of women say the same. Richa Chaturvedi is an intern focusing on U.S. politics and policy at Pew Research Center.